If you are reading this page, it means you somehow stumbled across it while searching through my blog. Maybe you really are interested in who the person behind this blog is, or maybe you just clicked on a link and arrived here . . . I don’t know, but here you are, and here I am trying to tell you who I am. There are a lot of things I could tell you about myself. I could tell you about my family . . . . My husband and I have five boys . . . currently 17, 14, 12, 10, & 7. They are growing way too fast. Of course, we knew they would grow way too fast . . . everyone is always warning us that they grow way too fast and, yes, indeed, they are growing way too fast. I love my boys, but being their mom is not always easy. In fact, it is never easy. I mess up. A LOT. I wish I could say that I had perfect mom moments all the time, but that would be an outright lie. In all honesty, I lose my temper, say the wrong things, refuse to say the right things, sit at my computer instead of spending time with them . . . far too often. I see them growing up and I know my time with them is limited, yet I still mess up. I write blog posts with fun activities to do with kids, but I still feel like I don’t spend enough time with my own kids. I am far from perfect when it comes to being a mom. In fact, I would say that I am a work in progress. I could tell you about my job. In May of this year, I started a new job with our local Pregnancy Resource Center. This is a ministry where I have served as a volunteer for the past 7 years, so I was super excited when I was offered a position on staff. I am the Project Manager, which is a fancy way of saying that I work on events and other fun “projects”. This is a part time job – some of which I am able to work from home – and it really has been an answer to prayer. And, while I am thankful for this job and while I feel that this is right where God wants me to be, I still struggle with uncertainty and lack of confidence at times. I know there is no way I can accomplish anything in this position without God’s help . . . and I really, really need His help! Like I said, I am a work in progress. Then there’s this blog. When I first started this blog, I had dreams of becoming an internet sensation over night. Guess what? It didn’t happen. For months, I would check my blog stats every day only to see that a handful of people (if any) had actually visited it. More people are visiting it now (so glad you’re here), but I would say I am far from an internet sensation. I really do care about everyone who visits this blog, and I am sooo humbled that people are actually using the lessons and ideas that I write here . . . but I also want people to know that I am just an ordinary person. That I am, truly, a work in progress. But the work that I am is being formed and molded by the One true King . . . the King of Kings. If He can use ordinary, imperfect, messed up me and my silly little blog, He can use anyone. He can even use you. Awesome! So glad to see you are stepping out onto the next mile of your path! The main thing is..to keep moving forward! Thank you so much for your encouragement. Watching you step out in faith to write your book has been a huge motivational factor in what I have been doing . . . thanks for serving as an inspiration! We are all on this together. As we step out in Faith to let our light shine…and others are encouraged to do the same…one small light becomes brighter as we all come together to shine for the Glory of God. It is exciting to see others use their talents and gifts! Thank you for your post…”Keep thinking good thoughts”…and sharing them with the world. You have a gift to share! Thank you, Charlotte. I appreciate your encouragement! Hi Cheri, I am new to your blog. I really love your prayer calendar idea and wondered if I could use them at my church. Also I was wondering what church you are affiliated with. Thank you for all the work you have put into your blog. Thanks so much . . . yes, please use the prayer calendars with your church! 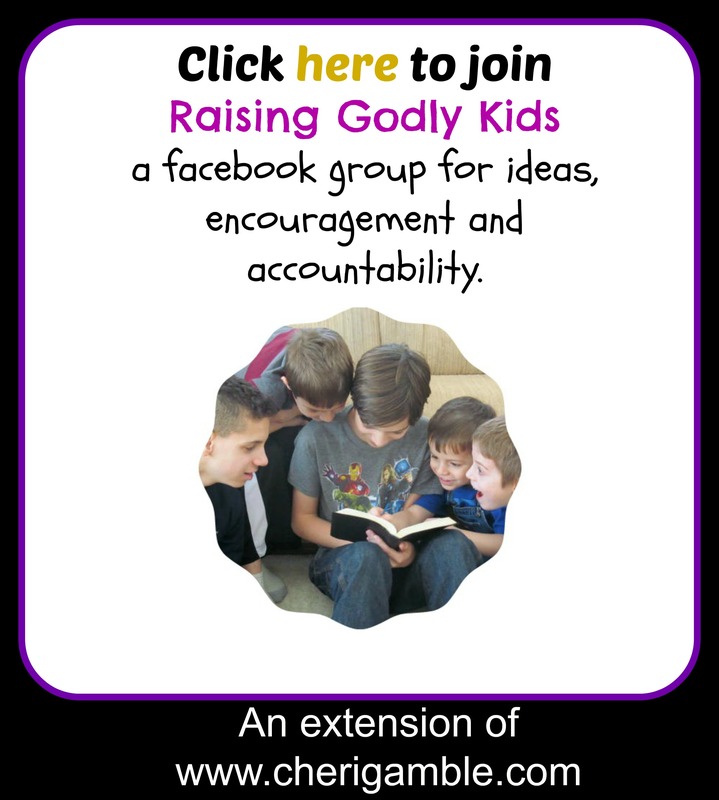 Everything I share on this blog is free to use with any church or family ministry. My husband and I serve at a nondenominational Christian Church in the Midwestern United States. Thanks again for your comment and I’m so glad you stopped by! I’m a church school preschool teacher, A teacher Assitance in the Resource classroom at work, a mother of a 8 & a 29 (almost 30) year old, & a G-Ma of 3 granddaughters & one 8 year old & I coach my son’s 8U basketball team. I really didn’t have time to study my lesson this week about Daniel even though I ‘be read it several times. I type in crafts for Daniel 1:19 & your site Do what right came up & that is just what I needed an icebreaker giving them old Magazines & letting them cut out good & not good foods to eat was awesome before I taught my lesson was great. I love your all about me, prayer calendar the most because I can use these things at home,church & in the community. ❤️🙏🏾Keep doing what your doing because we all are a work in progress. Thanks so much for sharing this with me!! I am so glad you are able to use the stuff I post 🙂 God bless you as you serve Him! Cheri – your preschool Bible lesson on Daniel 1 was very helpful to me as I was pretty stumped with how to conduct the lesson for 3-5 yr olds. Thank you! I am using the story to help the kids know that they can make good choices. God bless you for sharing! Thanks for sharing this! So glad to hear! !